Wow! 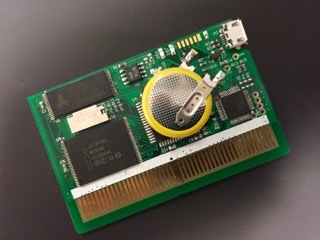 I love the gamepie advance concept. I would love to see something similar for Neo Geo Pocket. Nothing compares to that clicky-stick. (In fact I’ve tried wiring a control inputs from a Neo Geo Pocket board to a Pi Zero before). Thanks, Colin. That’s pretty cool that you hooked up the NGPC board to a Pi. Did you try to stuff it back into the NGPC shell? There are a few reasons that the GBA shell is better, but the main reason is that it’s easily available in reproduction form. To do it with NGPC, you’d have to sac a NGPC (which isn’t as appealing to most people). I wasn’t able to fit it into the existing shell. And yes it required the sacrifice of a NGPC. But I love that clicky stick. Now I am looking at extracting the clicky stick from the board, so maybe I could place it in an entirely different enclosure. FWIW the clicky stick on the NGPC is just made from older style mouse tact switches. Most older PS/2 mice should have them, or search eBay for “mouse tactile switch.” The square ones are the ones you’re looking for (although the rectangle ones will work just as well, probably). I was trying use that setup on a project as well and found nothing about it anywhere, so just passing along the info. Worth a shot to recreate one and not have to sacrifice an entire NGPC. Wow that game pie advance looks awesome! When can we expect to see on eBay? I wonder if a DS could be used. The older, fatter ones or maybe the wider ones with the larger screen. You’d have a touch screen in any event. So you’re making a custom Pi for this or will users be able to pop in their own Pi? Also, are the ports all still going to be avialble if you want to connect controllers, or plug it in to your tv ? Looks great regardless. Love it! Yeah, if you watch the video (it may not be obvious) you can see us playing on a HDMI monitor with a USB controller plugged in. There’s a USB port and a HDMI port where the GBA cartridge would normally go. It’s actually the Raspberry Pi Zero that’s there. The PiZero plugs into our board. Good job. I was thinking of turning my Game Gear into one of these but GBA is even better. I’ll have to check out that auction myself. Woah, those are both really awesome projects! Great job! I’m definitely interested in building a RPA; sounds like a fun project! Awesome, I’m definitely interested. Are you guys planning on adding extra 2 buttons to have 6 button goodness on this? I wanted to add XY, but we couldn’t come up with an easy way to do it. Getting something made ASAP was higher priority. There are some connections on our board where you could run the wires to buttons if there was a good place for them. I will definitely be trying to figure this out. It’s a feature that many people want. Can you sell gamepiedvance only pcb with ic? What lcd size you use for gamepieadvance? At this point, I expect to do a DIY kit with the complete PCB and an LCD. It uses 3.2″. I know there hasn’t been anything posted here for 6 months, but I’m curious to know: Are there going to be any more of these flash carts made? We have posted here more recently, but not much about the WonderSwan flash cartridges. We just recently sold out of those. When I get back to the office this week, I will probably evaluate our parts to see if we have enough to make any more. Once we run out of parts, I think it will be quite a while before we make new circuit boards. Any idea when you may be making more Wonderswan carts? Do you think it is likely you will make any more WonderSwan Flash cartidges in future? Would you consider making them to order? I think that we will make more at some point, but the reality is that we are pretty swamped with our Freeplay Zero work at the moment. I can’t say when we might get to making them again. Cool projects! I’m also interested in a WonderSwan flash cart when you make another batch. Hey mate, any chance you could email me and let me know when I can get in on the next batch of these. thanks. Anyone selling their WS Flash cart or do you have any eta on availability?